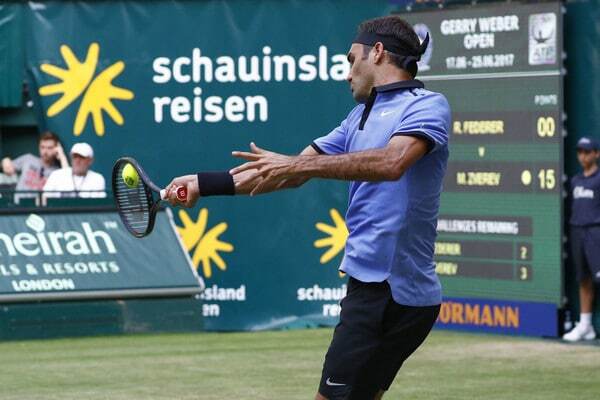 Match win nummer zwei in Halle for Roger Federer as he defeated Mischa Zverev 7-6(4), 6-4 to move into Friday's Quarter Finals. The straight sets victory means Fed has yet to drop a set against the older Zverev in 4 meetings and he'll be facing off against another German tomorrow; in the shape of Florian Mayer whom he leads 7-0 in the H2H. Zverev won the toss and elected to receive. Federer held to 15, firing down back to back aces for a 1-0 lead. Zverev responded with a love hold, and both players began to roll comfortably through their service games. At 3-3, adv. Federer, the Swiss called out ‘come on' before the point finished. The umpire called a hindrance and replayed the point, although as per the rules Fed should have lost the point. With Deuce the closest Zverev could get to breaking, Roger was able to go one better in game 10, as he held three set points but the German was able to hold on, and the set eventually went to a tiebreak. Into the breaker and Roger fashioned the early mini break thanks to a sweet passing shot. However, he missed a relatively straightforward smash at 3-1 to relinquish his advantage. Zverev then moved 4-3 in front, but Roger was able to reel off the next four points to take the set and put himself in the driving seat. Set two was much like the first with both guys holding serve routinely. Roger was able to make some inroads creating 0-30 in game three, but neither player lost more than 2 points in a service game until game nine where Roger upped his level to break to fifteen and serve out the match to 30. Good win here against an in-form player on a surface that suits his game. Mischa has been playing well all year and looked impressive in Stuttgart, so I think Roger winning in straight sets is a solid performance. It was evenly matched for the most part with Zverev able to do plenty attacking of his own, but Fed just had a few more ways to win points when it came down to the crucial moments. Still, work to do of course, but it goes without saying it's his best match on the grass of the season so far and it looks like he's making steady improvements match by match based on the three we've seen so far which is good news. Next up is Florian Mayer who defeated last week's Stuttgart champion Lucas Pouille to keep the hopes of defending his title alive. 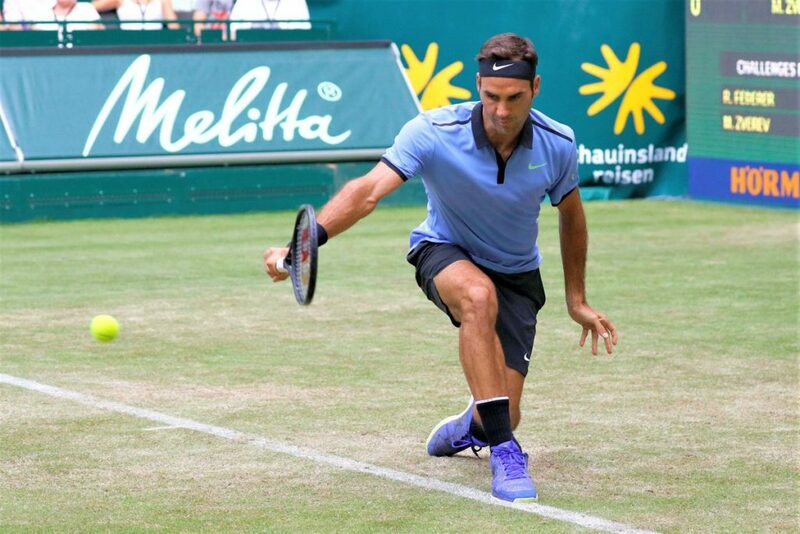 Roger has played Mayer seven times, winning all seven and has three straight set wins against the German in Halle and a win last year in Stuttgart, so the odds are firmly in his favour. Mayer can certainly play on grass though as we saw last year and his funky style upsets the rhythm of plenty players. But Roger has seen so many styles in his career that it doesn't seem to cause him that many problems and I think he'll come through, but I expect a close scoreline (last year was two tie-breaks at the Mercedes Cup) so this one could be a three setter. What did you guys think of today's match? And any predictions is Mayer? Let me know in the comments. Good win from Fed, played solidly throughout and came through unscathed despite Zverev's good form. That was supposed to say first. Gotta be quicker on the draw! Good win, I felt. Tough match, really, given that he was against an in-form player who is very good on grass, but he did well to keep him at arms length and came up with some spectacular shots in the clutch. 4th seed at Wimbledon sealed! Yeah was a nice brand of tennis from both. Zverev has some good volleys. MANY brilliant and brave points. Our Fed is indeed back on court! Just watched a replay video on Youtube. Fed’s anticipation and shot planning are still as astonishing as ever. I thought he played far better than the score suggests, although Zverev was playing well too. Thanks for the summary and thoughts, Jonathan. Yes it was a decent match. Zverev had chances too but Fed just better all round. Enjoyed the match thoroughly due to the serve & volley tone. Lovely points by both players but of course Fed was decidedly better, though Mischa did hold his own many a time. Nice write up! V good match! Mischa first volley was for the most part exceptional and Fed had to work his way into those service games. It was the 9th game at 4 all 2nd set, when he broke, but I’ll let you off, ?? and loved that ripper drive volley before the passing shot! So quick to see the opportunity! Second serve cld do with more work/angle on it otherwise the big return guys will be all over it! Ps if he wins Halle wld grab no 3 seed so preempting much publicity about a Fedal final…..
Ah yah 9th game. Updated. Yeah 2nd serve bit vulnerable this week so far, Mayer getting hold of it. Cilic dark horse for Wimbledon? Very nice write up particularly for someone like myself who couldn’t watch the match. I always thought this would be a potentially dangerous match, so very glad to see him come out of it unscratched. He’s looking better and better match by match. That’s the most important. Hopefully I can catch some actions on the weekend. Can someone please tell me why the match was suspended at 2-3 in the second set? First serve percentage not very good: I was impressed when he reeled off 2 aces in the first game, but did the serve go downhill from there, or something? A lady in the stands had a medical issue (I think) so they tended to her before play resumed. I heard there was a spectator requiring medical assistance. Oh, right, thanks. You never know, these days. Someone in stands became ill or had medical problem. Good win, improving with each match. Though Mischa was a better player in the first set but Roger won at crucial moment stringing a few good points. Second set he was able to do more returns and break just in time. Let’s go Rogerrr. I’ve never seen Roger commit a hindrance before. Kinda funny that the commentators didn’t realize why the point had been stopped. Wow, tennis! Volleys! Angles! Quick reflexes! Now he’s won, I can enjoy all that! As you say, should come out ahead tomorrow, but Florian has certainly shown he can play on grass; Mischa will have been good practice for our guy I think. Nice rolling action when he fell; Didn’t hit the left knee at all, – if anything were to be affected it could be the right (serving) shoulder, so hopefully he’s had a good massage & his apparent I-wasn’t-affected-by-that holds. If he can’t survive a tumble like that then it’s time to give up. It was a dive onto soft ground. Even Nishikori could walk away from that unscathed. Well maybe. I know I shouldn’t look too far ahead but it looks like Federer and Alexander Zverev will make the final. This will be a tricky encounter. It would tell us if Roger is really ready for his 8th Wimbledon title. Again, the draw at Wimbledon will be very important. I feel that should Roger reach the latter stages (semis and or final), he can’t be stopped. Again, assuming that he won’t meet someone like Zverev in the final. Kyrgios is injured. Nishikori also. Not too much worries regarding all the other “top” dogs. It’s the middle rounds that will prove decisive. But anyway, let’s see if both Federer and Zverev will win their respective matches tomorrow. Zverev has been knocking on the door. Kyrgios took him out in Miami before his epic 3-setter with Roger. Then, Zverev beat Novak at the Rome final before losing in the 1st round at the French. 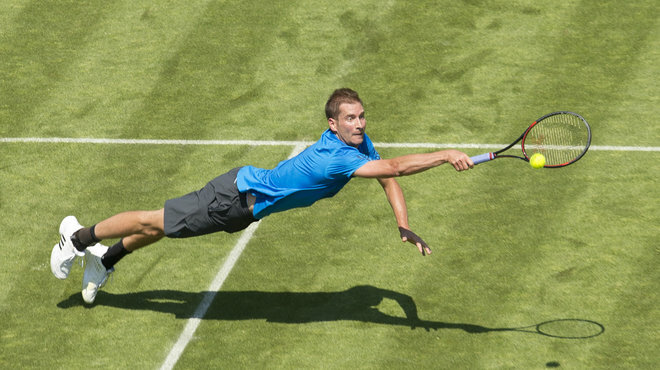 His game is primed for the grass so I just hope that he won’t derail Roger’s hopes for Wimbledon (either beating him here and/or falling in Roger’s section) at Wimbledon. Tomorrow and the next few days will be very interesting. The match was a real nail biter and my hands were shaking even after the final point. What a relief to see Fed will be seeded # 4 at Wimby. BTW for those who can’t see ATP matches on local tv or satellite, Tennis TV is brilliant. I split a yearly subscription with another FedFan so the cost is not too much. This is allowed by tennistv. Also you can watch hundreds of classic and replay matches on demand. I am not pushing Tennis TV, but it’s a great way for FedFans to watch. Donna, how can you split it? Can both parties see whatever they want? They probably allow 2 concurrent logins. I’ve done it with mine before. But I didn’t know it was permitted though, I guess you emailed and asked Donna? Oops, sorry I just saw this question . Yes, in their facts I think they specify that you can have two different screens or something like that. I am going on my second year of this subscription and all is well. Thanks for that Donna, I’ll check out Tennis TV. Off topic here, but what an idiot. Hey Sue, yeah, the Carrot really is an idiot 🙂 I kind of think he wants his job back. He talks all nice and good things about Novak, says he should change coaches and tells him through his TL to wake up and see Roger & Rafa’s level 🙂 I don’t know, but it does look like he wants to be Novak’s coach again. Wonder what really happened between them….. I doubt he’s bankrupt. I’d like to know what the debt is though. Whatever Roger does he does gracefully, even falling as you mentioned Katyani. Roger can never fall from grace !! !